Oven fresh style at Zeppy's pizza. Finally we can show you some more of the Lookbook we shot for Lori's shoes. We were informed that the Lookbook will be debuting in mid April but Lori's loved the photos and said they couldn't wait, so they put some Favorites up on their Blog already as a preview. They sent us boxes of clothes, shoes and accessories to shoot. After some conversations with Lori's wonderful staff, we decided to style the shoot incorporating some of our own pieces to show how we'd actually wear them. The fun hot pink patent pumps made us want to style the shoot with a colorful, playful vibe and the cute striped skirt with a little gold quilted bag, just felt very Cher from the movie Clueless but with a bit of Blair Waldorf of Gossip Girl as well. 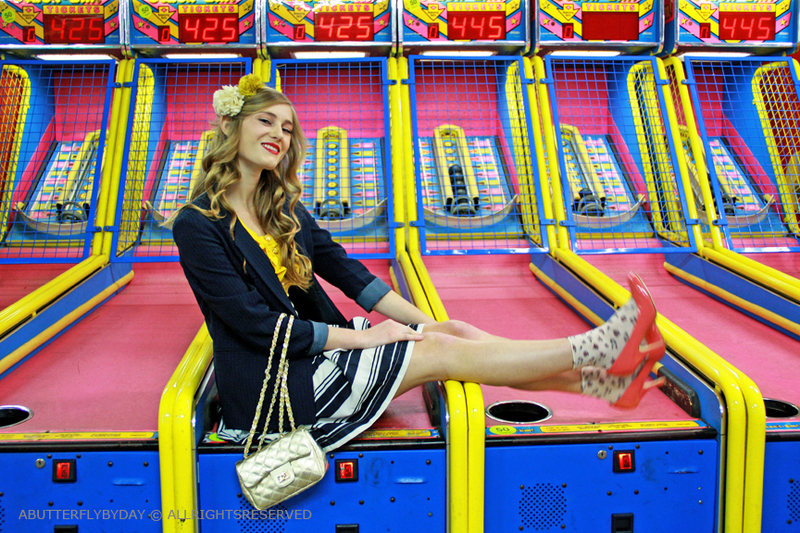 It was a spring lookbook, so we decided the feeling needed even more color and a bit of real West Coast charm, and because of that heading down to the Pier and Arcade seemed fittingly appropriate. The Frisky asked us to give them a list of some of our favorite things. For most of you that read our blog often you probably know some of our list already but if you want to go see the post you can view it here. OMG!!! this is such a fun outfit!!! Like the location too! These pictures are so much fun! Love the socks with the pumps. I wish I could pull that off. I love it when a look and the setting become one. the background is all about fun and colors. the pink and yellow colors are just fabulous and they bring the outfit alive. i actually love everything about it. the skirt is fabulous because of the print. i love the adorable blouse because of the ruffles. the shoes are perfect with the little socks. Nothing I like better than your outfit posts. I love the whole ensemble soooooooo much. Ahhhhhhhhhhhhhhhh you are atrue inspiration. you had me at skee-ball, lol! love what you did with the pieces...the colors, stripes, and location are just perfect :) nice work, guys! Just stumbled across your blog. Love it! Your pictures are as beautiful as your words! ah you girls are so much fun!! I LOVE YOUR BLOG!!! Great coloured outfit! Oh my god! I really love your outfit! wow!!!!!!!!! I'll be follow you! i you want follow me back!!! Love you photos and you look!!!! These photos are just amazing ! Thanks for your comment, I love your blog ! Such great photos, love the last one the most dears! And ya! I'm definantly a follower!! Thanks for checking out my blog and for your sweet comment! Loved your blog, i'm following! pls check out mine I'd love your opinion!! You look DARLING! I absolutely adore the colors. Those pink patent pumps are TO DIE FOR. Great and colorful! So fun this post, you look amazing, happy and sooo soooooo cute, color are for YOU! And thank you thank you very much for your comment, i love it! Kisses and come to visit me again! Amazing outit!! I love the Clueless movie, and GG too, of course, so it's perfect!! ooo so fun! I love the little socks with the shoes. Thank you for stopping by Goodwill Huntingg. this outfit is really romantic in my opinion! Absolutely yuor follower from today! So cute!! I'm in love with the top, it's so precious! wow! the colors are wonderful! I love colors too!